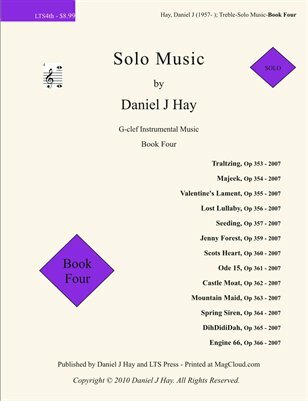 A collection of solo music by composer Daniel J Hay. These pieces composed in 2007 are suitable for most treble clef instruments including Recorder, Oboe, Flute, Violin, Clarinet. Titles included are: Traltzing, Majeek, Valentine's Lament, Lost Lullaby, Seeding, Jenny Forrest (dedicated to Tom Hanks and the cast of the movie Forest Gump), Scots Heart, Ode 15, Castle Moat, Mountain Maid, Spring Siren, DihDidiDah, Engine 66.